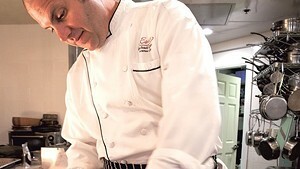 On February 6, as some of the best chefs in the world looked on, chef Michael Clauss of Burlington zipped around a tiny temporary kitchen at the Culinary Institute of America in Hyde Park, N.Y. One minute he was slicing bright red radishes into perfect right triangles; the next, shredding pricey black truffles. Under the watchful eye of his former boss, Daniel Boulud, and an estimated 800 other chefs and foodies, Clauss was competing to represent the United States at the Bocuse d’Or competition in Lyon, France. The grueling cooking session — and three hours of waiting for the judges’ decision — ended without a win for 35-year-old Clauss. But simply having been chosen for the competition places him among the nation’s elite up-and-coming chefs. So does his former position as executive chef of Daniel Boulud’s New York City Feast & Fêtes catering company and sous-chef at the restaurant Daniel. So what’s Clauss doing in Burlington? Some locals may be surprised to learn that he’s heading the kitchen at The Daily Planet, a venerable downtown eatery known for its quirky comfort food and casual atmosphere. Joe Perrotto of the Vermont Fresh Network and Jason Zuliani, co-owner of Dedalus Wine Shop, watched Clauss cook at the CIA as his competition sponsors. They and other Vermonters in attendance noted how incongruous it seemed to see the Planet, which has had its ups and downs over the years, listed alongside the other competitors’ acclaimed places of employment, including Charlie Trotter’s in Chicago, The Modern in New York and the French Culinary Institute. Is Clauss aiming to put the Planet in that company? No, and for good reason. There, four staffers squeeze around each other in the tiny kitchen. By contrast, at Daniel, nearly 20 chefs work nightly to oversee every detail. What kinds of new twists can Planet diners expect to find at their old standby? For one, Clauss serves oysters with a drizzle of lemongrass water instead of classic mignonette sauce. His mussels, juicy and plump, come in a bowl of buttery ginger-beer-laced broth, draped with braising greens and studded with bits of black garlic. The house-made veggie burger is dressed with mayonnaise mixed with shiso, an exotic member of the mint family. Despite his pedigree — or perhaps because of it — reviews of the restaurant have been mixed since Clauss took over in January. On the Seven Nights website, patrons have complained that the Planet’s new food isn’t as exciting as they expected, given the chef’s credentials. And many have griped that the interval between ordering food and receiving it is way too long. Spence describes Clauss’ menu as offering “a lot of things [that] are more appealing [than before]… There’s stuff that looks good to me that I wouldn’t normally try.” So far, she’s enjoyed the olive-cured tuna appetizer, a snazzy riff on a Niçoise salad that comes with chickpeas, roasted pepper, arugula and quail egg. The pork loin entrée with homemade daikon sauerkraut was another hit. Now Spence is looking forward to trying a dish of polenta with Cabot clothbound cheddar, a seitan crackling and honey crisp apple. Curiosity — and a personal connection — brought Colfax back. “I read about the new chef, and it was a kid I went to high school with,” he says. Last week, Colfax returned to the Planet for the first time in several years. This time around, he was intrigued enough by the entrées to eschew his usual burger. “We had the gnocchi with duck confit. That was ridiculously good. I was blown away,” he says. “I’m not a huge lamb fan, but I thought the lamb sausage [served with rigatoni, broccolini, Parmesan and sage cream] was delicious.” Next time, if it’s still on the menu, he’ll order the popular “Sloppy Joe,” tender Boyden Farm short-rib meat in a sweet barbecue sauce on toasted foccacia. But his loss could be the Planet’s gain. A month and a half into Clauss’ tenure, the kitchen is already turning out perfectly seasoned food made with excellent local ingredients. Aside from the occasional lengthy wait, a critic’s only complaint might be that some of the well-executed fare on the menu is a touch ordinary. The broiled veal chop with mashed sweet potatoes, Seckel pear slices and maple butter is delicious but unsurprising. The house-made fries are entirely commonplace. That small complaint may soon be a thing of the past. Now that Bocuse d’Or USA is over and his kitchen staff has coalesced, Clauss is preparing to make a few changes to the menu and, most importantly, to offer more daily specials. “We have five or six a night, and I’d like to do more once we get a little more comfortable with the menu,” he says. “I’ve been working hard to offer seafood you can’t get anywhere else, like St. Lawrence smelts.” Local lamb sweetbreads and rabbit have shown up as meat specials. “We’re trying to get exotic things, because specials should be special,” Clauss says. That includes its superhero connection. Though Clauss wasn’t hired for being faster than a speeding bullet, he shows himself game to tackle a threat to Metropolis’ safety during our interview, when he suddenly notices an unoccupied car rolling backward down Center Street toward busy College Street. Without a pause, Clauss runs out the door of the bar, leaps into the moving vehicle and puts it in park. Then he jogs back inside to continue chatting. “Chefs have to pay attention to everything,” he says casually, and takes another sip of his coffee. When chef Michael Clauss of Burlington competed at Bocuse d’Or USA, he joined a select circle. That was clear from a glance at the judging panel. As Clauss chopped and sliced, Thomas Keller, owner of The French Laundry and Per Se, shook hands and chatted with his legions of fans. Grant Achatz of Chicago’s Alinea, known for his cutting-edge cuisine, grabbed a snack from a vending machine. A few steps away, Momofuku owner David Chang, who’s famous for exquisite ramen and pork buns, and for having perhaps the worst potty mouth in the biz, autographed copies of his recently released cookbook. Clauss and his 11 opponents had five hours and 35 minutes, split over two days, to concoct breathtakingly beautiful platters of food — one featuring Scottish salmon, the other, Colorado lamb — and present them to the panel of famous judges. But the recent Burlington transplant seemed relaxed under the pressure. While most of his competitors wore looks of grim concentration, Clauss broke into a grin on several occasions, and he pumped his fist when his cheering section, headed by fiancée Alexa Bolanis and her parents, held up hand-lettered signs to encourage him. Clauss had help from 19-year-old CIA student Marcella Ogrodnik, who served as his commis (apprentice) for the competition. For their initial offering, Team Clauss created a Shallow Poached Salmon Torte layered with scallop mousse, edamame, mango and sauce Maltaise — hollandaise with a blood-orange twist. Alongside was a Baby Fennel and Pomelo Salad with fennel pollen and sea beans, and Savory Rice Pudding with sea urchin roe, Asian pear and wasabi foam. Next up was a bright green, persillade-crusted lamb saddle, stuffed with a heady filling of pork, lamb, foie gras and black truffles and served with a classic truffle sauce and grilled lamb kidneys. It came with Warm Ratatouille, a Creamy Leek and Sweetbread Tartlet and puffs of pomme dauphine made with Winnimere cheese from Jasper Hill. The finished product was presented to the judges to the strains of Metallica’s “Enter Sandman” and cheers from the Vermont contingent in the crowd. The judges tasted all the contestants’ food — including Clauss’ — without expression. Keller tilted his head as he chewed, glancing often at the dish descriptions beside him on the table. Achatz appeared quizzical when he tried the unusual rice dish, but it was unclear whether that was good or bad. Then the plates were cleared away, and it was on to the next contestant. All Clauss could do was wait. The results wouldn’t be announced for another three hours. In the end, it wasn’t Clauss’ year — James Kent, sous-chef of Eleven Madison Park in New York City, was chosen to represent the United States in Lyon. But petite Ogrodnik took first prize among the commis. The pair’s platters were memorable and filled with bright colors and appealing shapes, and Clauss’ cowbell-shaking cheering section was the loudest one around. Clauss isn’t planning to compete again, but he isn’t ruling it out completely. For now, though, he’s got another big event to focus on: his wedding.